They're changing guard at Buckingham Palace - Christopher Robin went down with Alice. 'Curl up with A. 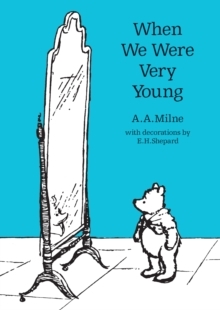 A. Milne's classic book of poetry for children, When We Were Very Young. This is the first volume of rhymes written especially for children by Milne - as popular now as when they were first written. Featuring E. H. Shepard's original illustrations, this collection is a heart-warming and funny introduction to children's poetry, offering the same sense of humour, imagination and whimsy that we've come to expect from Milne's favourite books about Winnie-the-Pooh, that Bear of Very Little Brain. Do you own all the classic Pooh titles?Winnie-the-PoohThe House at Pooh CornerWhen We Were Very YoungNow We Are SixReturn to the Hundred Acre Wood The Best Bear in all the World The nation's favourite teddy bear has been delighting generations of children for 90 years. Milne's classic children's stories - featuring Piglet, Eeyore, Christopher Robin and, of course, Pooh himself - are both heart-warming and funny, teaching lessons of friendship and reflecting the power of a child's imagination like no other story before or since. Pooh ranks alongside other beloved character such as Paddington Bear, and Peter Rabbit as an essential part of our literary heritage. Whether you're 5 or 55, Pooh is the bear for all ages.